Discussion in 'Mapping' started by Tyrex, Sep 21, 2016. Set in Kabul, Afghanistan, started a few days ago. I would love any and all criticism and additions. I'm thinking about moving the spawn somewhere else and having the mosque be in the middle of the map. I have a large market area planned near the mosque which will be for rations and I'll also include a slums area with worn down buildings, etc. I'm going for a very rugged and practical look for everything. Nexus done outside of detailing and final fixes. Sorta reminds me of that old map, rp_cscdesert. Looks good so far, keep up the good work. Could use some more subtle environment lighting, and some more complex geometry. 2. Abstract geometry. Make things pop more, the map looks GoldSrc era, you can do this by rounding things out and adding more edges and things that stickout of the walls. Same with decals, prop placement, and more. 3. Overuse of brushes for props. Like I said before try to get used to working with props for certain details like windows and such. It'll help you in the long run to make things not only look a lot better but less squary. Other than that, it's not a horrible start but prepare for a very long development and very long sequence of struggle, frustration, and anger when making roleplay maps. Thank you very much for the advice, I will change the ladders to stairs and I'm going to use the ARMA 2 houses for reference as suggested by a friend. Looks a lot better. Could ease up on the fog, and maybe also play with displacements a little, y'know? You can try and inspire from rp_city8_district9 for the desolated desert environment. The map is extremely beautiful and it contains similar type of buildings and style you are trying to create. Thank you very much for the advice, I'll be sure to check it out. did you copy and paste the large gate brushes from city 18? Yes, sir. I'll likely modify them later, they're just a placeholder for now. Alright, that's cool. Try going with something that's more fitting in your environment. Sort of like a hybridization of both Islamic architecture and Combine architecture. 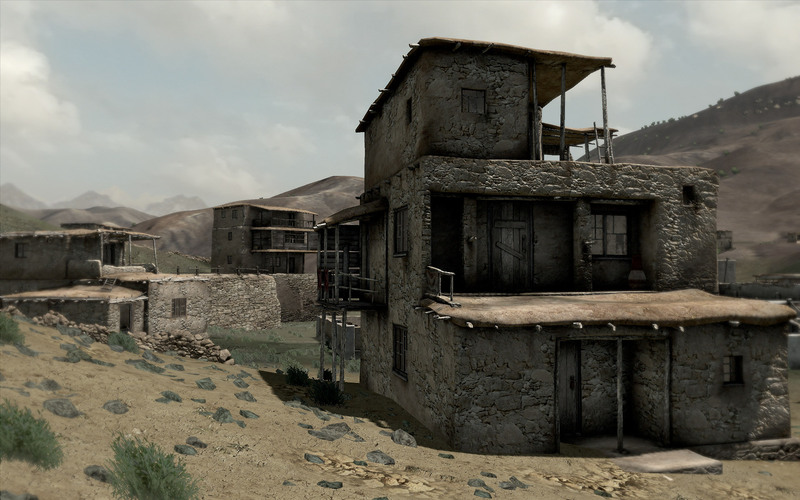 Also try looking at real-life references of Kabul. Made a lot of progress so far, still need to decorate the Nexus along with expanding that 'underground tunnel' area. Also need to add soundscapes around. I also threw HDR on, please tell me what you guys think. It would be cool to have the Mosque be the Nexus or something. Like the majority of it having the original Afghan architecture but the rest having Combine metal/doors etc. I'll mess around with the fog as see what I can do, thank you! The mosque is the Nexus, check out the first video for the tour, I still have to decorate it a lot more, though. Map is complete and uploaded on the Steam Workshop! Thank you all for the feedback and I will continue to work on this map in the future so please leave any additions you would like to see. I know the map is on the small side, so expanding the citizen areas is definitely on the list. I hope you all enjoy!